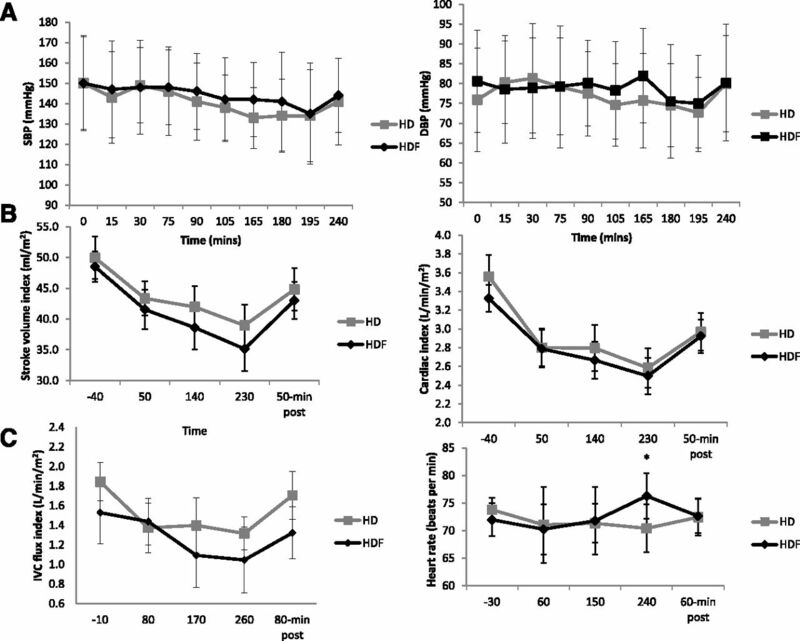 BP and cardiovascular responses predialysis, during dialysis, and postdialysis for HD and HDF treatments. (A) SBP and diastolic BP (DBP) data. (B) SVI and CI measured using PC-MRI of aortic flow shows a significant decrease during dialysis, reaching a nadir after 230 minutes and partial recovery at 50 minutes postdialysis. (C) IVC flux shows a decrease during dialysis and recovery after treatment. Heart rate did not change significantly throughout either dialysis treatment. *However, at 240 minutes, it was significantly different between HD and HDF (P<0.05). No differences in effect of HD or HDF on myocardial perfusion. Baseline perfusion and nadir perfusion during dialysis for both HD and HDF. Significant decrease in perfusion is seen for both treatment modalities. No significant differences in effect of HD or HDF on relationship between circulatory stress and cardiac response. (A, i) A positive correlation between number of dysfunctional LV segments in the long axis and UFV for HD (r=0.70, P=0.02) and HDF (r=0.59, P=0.05). (A, ii) A negative correlation between change in SVI during dialysis and UFV (r=−0.813, P=0.01 for HD and r=−0.838, P=0.01 for HDF). (A, iii) A negative correlation between change in CI during dialysis and UFV (r=−0.831, P<0.001 for HD and r=−0.845, P=0.01 for HDF). (B, i) A negative correlation between change in SVI during dialysis and number of dysfunctional LV segments (r=−0.720, P=0.01 for HD and r=−0.698, P=0.02 for HDF). (B, ii) A negative correlation between change in CI during dialysis and number of dysfunctional LV segments (r=−0.502, P>0.10 for HD and r=−0.716, P=0.02 for HDF). (B, iii) A negative correlation between minimum SBP and number of dysfunctional LV segments was found for HD (r=−0.8, P<0.001) but not HDF. LA, long axis; SA, short axis. Schematic representation of study design and delivery. (A) Crossover, randomized, controlled trial design. 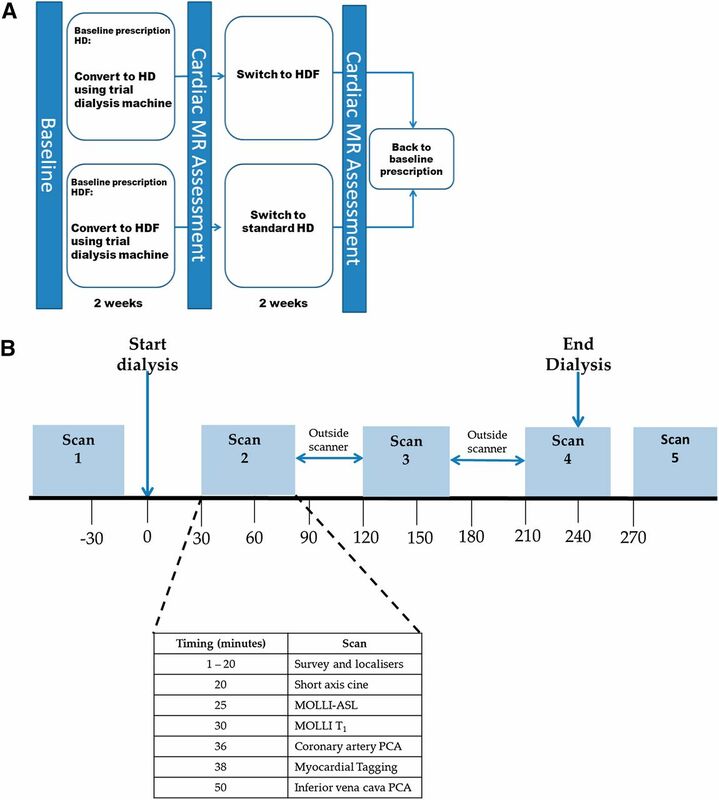 Patients were randomized to HD or HDF for 2 weeks, after which they attended a cardiac MRI scan that was performed before, during, and after a dialysis session. Thereafter, participants switched to the other treatment for another 2 weeks, after which cardiac MRI assessment was again performed. (B) Details of cardiac MR scan sessions are shown, with the timing of the acquisition of each of the multiple MRI measures of cardiac structure and function that were collected in each 50-minute MR scan session. PCA, phase contrast angiography. BMI, body mass index; NYHA, New York Heart Association; ACEi/ARB, angiotensin converting enzyme inhibitor, angiotensin receptor blocker. Data are presented as means±SEM or medians (interquartile range). IDWG, interdialytic weight gain; n/a, not applicable; UF, ultrafiltration; DBP, diastolic BP; URR, urea reduction ratio; PTH, parathyroid hormone; nT-proBNP, n-terminal–pro brain naturetic peptide; cTnt, troponin T.